For fast relief of sinus discomfort due to allergies and colds. Just squirt some of the bee venom solution in each nostril and you will be pleased with the results! 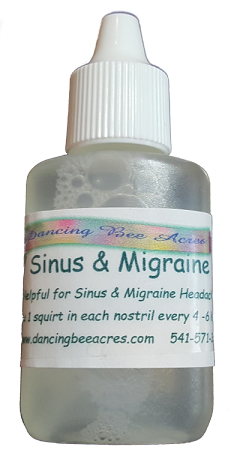 Use the same treatment for migraine headaches, as soon as you feel a headache coming on just squirt some in each nostril and the headache will be gone in minutes! The "Bees" are the doctors! 15 ml bottle with drop tip for ease of use. This product and the statements made about this product have NOT been evaluated by the FDA. This product is not intended to diagnose, treat or cure any disease. By purchasing this product, you assume full responsibility for its use. We make no promises or guarantees as to its effectiveness. I do not get migraines but this product clears my sinuses almost immediately and they stay clear for a long time. I have no idea how this happens but it is almost uncanny. I do not use pharmaceutical preparations as they have unwanted side effects. This product is however quite expensive considering it is such a small bottle and it does not last long. Great product! It helps our family with a stuffy nose and at the beginning of a migraine (together with the Vitamin B complex, Niacin and Magnesium). Thank you very much. I am going to buy it again. Copyright Dancing Bee Acres, LLC. All Rights Reserved.